Located at the Las Vegas Motor Speedway just a few minutes north of Las Vegas, Las Vegas RaZoR Adventures provides you with the ultimate off-road adventure using Polaris 2 and 4 seat RZR's. Click here for pricing and reservation info! Las Vegas RaZoR Adventures - Home of the awesome Polaris RZR! With Razor Adventures, there is a wide variety of territory that you will be adventuring through. From sandy trails and sand dunes to rough terrain and rock climbs, you'll be having a blast all the way! Watch the video, then call and make your reservations. See you when you get here! Our machines do everything an ATV or simple dune buggy does, and much more. Twice the horsepower, 4 Wheel Drive and long travel suspension make our RZR's able to navigate through terrain and scenic landscapes unseen by any 2 wheel drive buggy. Our fleet is all long travel S model Polaris RZR's, you won't be driving a lesser model than your guide! We have the finest off-road machines on the best trails. If you find anybody claiming they're cheaper, call us and we'll beat their price. WATCH OUT FOR HIDDEN FEES! No Fuel Surcharge, Free Shuttle Service, Free Water Bottles, Short Travel Time From The Strip, Long Adventure Time, Best Terrain Variety and 'Padded Seats' make us the best value and the most fun. Our office is located at the Las Vegas Motor Speedway just north of Las Vegas, no other off road tour is closer to the strip (and none are better). You can come to us or we'll send our complimentary shuttle to pick you up. We'll get you outfitted with helmets and goggles and give a brief safety orientation, then make the short trip to the riding area. That's when the fun begins. 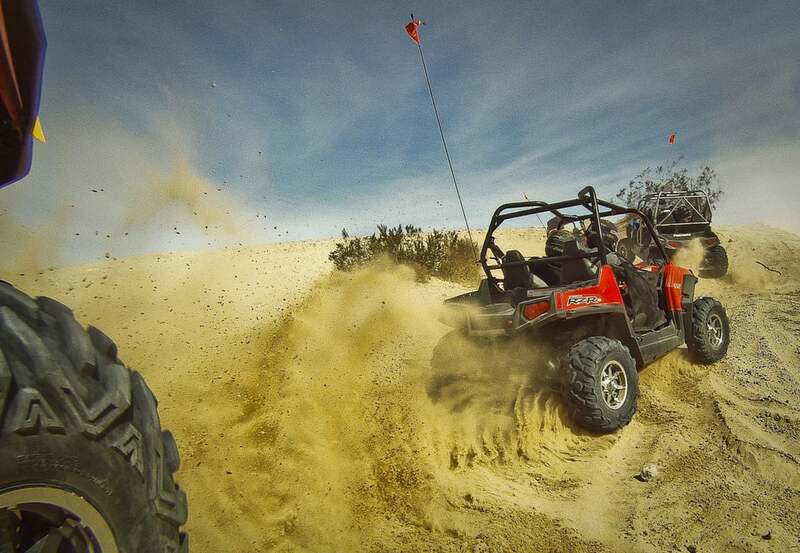 Call (702) 573-2167, Toll Free (855) 797-8687 or (855) RZR TOURS to make your reservation today! Thanks in advance for your business, we know you'll have a great time!!! Q:What clothes should I wear? A:Dress weather appropriate. We recommend long pants but not required. No open-toe shoes. Q: What is the pace of the tour? A: You set the pace of your tour. Whether you're looking for a sightseeing adventure or an offroad chase through the desert, we're here to satisfy. Q: Do I need off road experience to drive your machines? A: No, you will be driving an automatic 4 Wheel Drive UTV with a full roll cage and long travel suspension. It has the same controls as any automatic car or truck. Put the shift lever into drive and go. Even shifting into 4 wheel drive is just the push of a button. Q:How long is the tour? A:This tour is a full 2 hours. There is a stop in the middle for a photo op and water break and stops can be made to change drivers if needed. Bring a camera so you can get a picture of your adventure with the Las Vegas Strip in the background. Q:Where will you pick us up? A:We offer complimentary shuttle service from any Casino on the Las Vegas strip and will return you after the tour. Q: What kind of machines do you use on your tour? A: At Las Vegas Razor Adventures we use the top of the line factory made 4 wheel drive Polaris RZR-S (2 seater) and RZR-4 (4 seater). These machines were designed with quality, performance and safety in mind and both models have long travel suspension to provide the smoothest ride possible over rugged terrain. Wild enough for the off road pro and tame enough for the first time novice, our machines will not dissapoint. You'll be coming back for more! Go Play Vegas: Your Premier Las Vegas Entertainment Website.Your One Stop Destination for On Strip And Off Strip Entertainment, Dining, And Hotels In Las Vegas. Need Help? Or Would Like To Talk To Us?